I have been incredibly lucky this year in the books I’ve been able to read. So much so, in fact, that my luck has spilled over into next year. 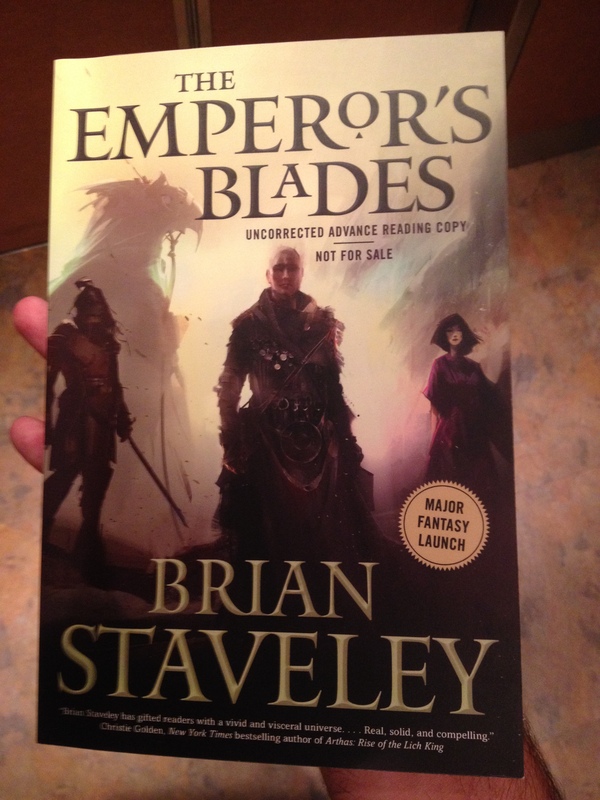 The Emperor’s Blades, which I’ve had the chance to read, by Brian Staveley, will be released January 14, 2014. This book tells the story of three siblings, Adare, Valyn, and Kaden, the children of the Emperor of Annur. Well, they were his children. The Emperor has been assassinated. The Emperor’s Blades, the first book in the Chronicle of the Unhewn Throne trilogy, investigates what happens to each of them immediately after his death. Adare, living in the capital, has to deal with the most immediate effects of her father’s death, and attempt to hold the empire together until the heir to the throne can return and become emperor. At the same time, she attempts to hunt down her father’s murderer. Kaden, Adare’s brother, is the heir to the throne. He has spent the past eight years in a remote monastery on the edge of the empire, training in the ways of the monks, yet never understanding why. He must now try to figure out what he was sent to learn before it is too late–it will be crucial to his success as emperor. Vayln, separated from his siblings by an ocean, is learning to be a Kettral; an elite soldier who, working with a team, flies into battle on the back of giant hawks. But before he can return home and grieve for his father, Vayln must pass the grueling but mysterious test to become a full Kettral, as well as avoid possible attempts on his life. There are a lot of decent books being published these days. I have read, and enjoy a large number of these, even if they don’t make me incredibly excited. There are even a good number of good books being published, ones that I truly enjoy and would recommend to my friends, and give high ratings to. These are not as common, but they are not too hard to find if you look through the reviews. And then there are great books. Books that will blow your shoes off and leave you stunned because the author has done such a magnificent job in their craft. These are the books that you recommend to all of your friends, and are often annoyed if they haven’t read them. The Emperor’s Blades falls firmly into the third category. I read the book during the semester, with my full load of classes. My copy comes in at 476 pages, and it’s certainly not a short book by any means. I have been rationing myself this semester, forcing myself to read slowly so that I have time for schoolwork and other activities that I need to finish. I read The Emperor’s Blades in 4 days. Once I started, I could not put the book down. The pacing and tension that Staveley builds throughout is incredibly well done. The chapter switches, from viewpoint to viewpoint, quickly reached the part where, at every single viewpoint switch, I thought “No! I want to stay with this character!” even though I had thought the same thing when I left the character I was returning to. It takes a skilled writer to make you feel this way about all of the characters in a book, and Staveley has done it magnificently well. The pacing will leave you breathless as you tear through the book, so be warned. The book was not perfect. I would have preferred to see more from Adare’s viewpoint (She definitely did not have 1/3 of the screen time. ), and some of the plot devices and world-building (the monks in particular) felt well worn. However, those shortcomings are greatly outshone by the rest of the book. In addition to the pacing, the characters were compelling. While I would not classify any of them as “lovable”, they are relatable, and that, perhaps more than anything, is the most important thing. Vayln, in particular, seems to just want to leave his island and get back to the kingdom, but must struggle through various trials first. Because I, too, wanted him to be able to leave, I sympathized with him. The ending was well executed, bringing various threads together into a satisfying and brutal climax, which left a lot open for the next two books. This book is not a “fun” book, the amount of death and other brutality is high, but it gives a very realistic sense to the world, and I wouldn’t want it even a notch lower. The world-building was interesting. There is, obviously, a lot going on behind the scenes here that we don’t know about yet, which I assume we will find out a lot more about in the next two books. I am going to with-hold judgement on the full extent of the world-building until more of the world is revealed, but what I have seen–including the chilling prologue–is excellent. And on that note… Ninja assassins on giant flying hawks? Why has no-one written that before? The Kettral are flat out awesome. I can’t even begin to describe how totally cool they are; you have to read yourself to get the full impact. And I highly recommend that you do so. I thoroughly enjoyed this book, and recommend it to everyone. Brian Staveley is an author to watch, and I predict this will be one of the best debuts, if not the best, of 2014. You can actually read the first seven chapters right now, here. If you want to pre-order your copy, you can do so from Amazon, here. I know I’ll be getting another copy when it is released. This is an incredible book, and the author deserves my money. Without question, I give The Emperor’s Blades five stars, and a high recommendation. Go read it! You can find Brian Staveley’s website here. Thank you. It was a very good book, and I’m looking forward to re-reading it, as well as the second one. I’m glad to see that we’ll have more of Adare–and a balance on female viewpoints overall. Release date is late next year (2014). Not sure when exactly, but all the work is pretty much done. Copyedits and such remain, but the book exists right now in more or less readable form. As far as the ARCs go, I’m just the guy who writes ’em, not sure how Tor decides how they are apportioned. How’d you get your hands on this one? The Tor.com speed sweepstakes here. I was very lucky, and I’m glad that I was. Yay, readable form. I’m glad to hear that things are moving along, and that I won’t have to wait too long for it. It sounds like I’m going to have some really good books to read in 2014. Brian McClellan’s The Crimson Campaign and Sanderson’s Words of Radiance. I’ve also heard rumors that Rothfuss’ The Doors of Stone will be out in 2014, though until a date is set, it’s all just rumors.